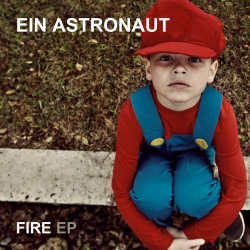 Ein Astronaut is a one man orchestra led by a young artist from Hamburg. With a whole room of instruments all of which he masters rather well, he records his songs in a manner that the final result sounds like coming from a regular band. What sets Ein Astronaut apart from most other bands is that he creates video clips for all of his songs right in the middle of his recording studio which can be watched on YouTube, giving people thus an impression of his panoply of instruments: guitar, bass, drums, keyboards, mellotron, percussion and other assorted paraphernalia. The fact that the young musician even plays the drums gives his songs a very organic feeling, but what makes his music so endearing is the fact that he is a tremendous songwriter. The EP Fire has now been released as a foretaste of his first longplayer to come later this Spring, and contains five tracks detailing his broad musical range. Starting with the title track, we get an upbeat and quite danceable take on indie pop, before We Quit heads into a more melancholic direction, with beautiful percussion and warm mellotron sounds, reminding me somewhat of The Notwist and Motorpsycho. More surprising is his rendition of La Roux’s Bulletproof. The original hit is in my opinion another example of anaemic Brit dance music, but Ein Astronaut gives the song finally some punch. The EP ends with the indie rocking Dead Souls and the very laid back Lullaby, leaving me with a truly good impression. Some may accuse Ein Astronaut of not having found his niche yet, but that’s exactly what makes his music so interesting, as not every song sounds the same. The backbone of the music is clearly indie pop, but Ein Astronaut is not afraid to let other influences into his songs. If the upcoming longplayer can build on this already excellent EP, we are in for something big.